[ARCHIVED THREAD] - Got a question: Why is the 10/22 Gatling not considered an NFA firearm? Because it won't continue to shoot if the trigger is pressed and the action is manual. Put an alectric motor to do the trick and you'll have a problem. Because the triggers are actuated once for every bullet via the crank. 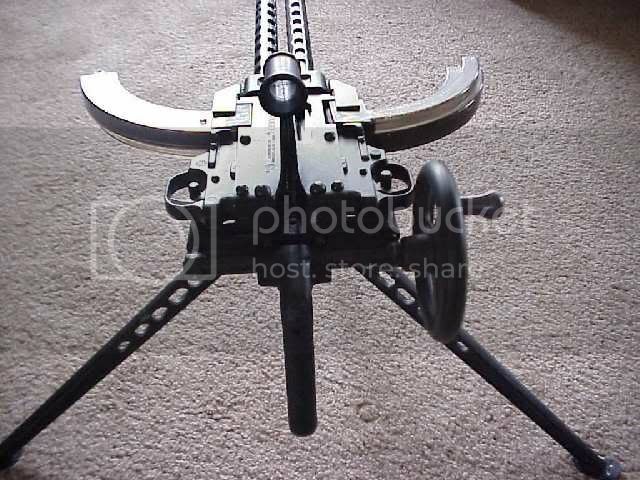 Cranks fitted to work with a trigger are not considered to be machine guns by the ATF. How much are those, anyway? So theoretically theres a market for crank driven gatling guns? There was (or is) a company that sold (or sells) the stand, brackets and crank gizmo. All you had to do was to add the two 10/22 and assemble it. I have not seen an ad for thes kits in a long while. Before the ban, there was always one at every gun show. Gee, didn't I just sound old. Oh well I am going to take my geritol and go to bed now. There's a site that sells blueprints and kits for building your own rotary .22LR gatling guns that look like the original weapons. Use 50-rnd stick magazines or 100-rnd donut magazines. When SHTF, just hook an electric motor to one of those suckers, add on some servo motors and a camera, and you've got yourself a full-auto remote-control minigun for a sentry turret. Bushwhack trespassers and invaders without leaving the comfort of your bunker.